There was a time when books were high up the ranks insofar as pastime favourites were concerned. Long before the invention of the television and radio, people would turn to books to be woven into the lives of fictional characters. But then came the advent of the 21st Century and with it, various technological advancements along with that thing called the Internet! Today, information is ubiquitous! And with the digitisation of media, the future of the hard copy book let alone the library itself is looking bleak. If everyone eventually has a portable device with access to volumes of digital books, will the library building still be relevant? Are libraries dying or are architects helping the library typology evolve with the times? The core of OMA’s design strategy was to redefine the library as an institution that was no longer exclusively dedicated to the book, but rather as an information store where all potent forms of media – new and old – are presented equally and legibly. At a moment when libraries are perceived to be under threat of a shrinking public realm and mass digitization, Rem Koolhaas combines these two seemingly opposing forces to create a flexible civic space. It is this success at blurring the lines between a thriving social gathering place and an adaptable store for information that has perhaps set it as an attractive Seattle destination that saw 2.3 million visitors in its first year. In an age in which information can be accessed anywhere, it is the simultaneity of media and (more importantly) the curatorship of its contents that will make the library vital. The first daunting task that the design team undertook was to comb through the myriad of programs and media that the library presented. They then were able to sort and consolidate five “stable” programmatic clusters: parking, staff, meeting, book spiral and hq. These five clusters were arranged on overlapping platforms according to hierarchical and logical spatial relationships. Then, they placed the “unstable” programmatic clusters, those functions whose evolution they couldn’t predict in between the “stable” ones. These spaces were dedicated to kids, the living room, mixing chamber and reading room. To aid the transition between each division, each zone was architecturally articulated and had its unique size, circulation, material palette and structural system. And that was it! 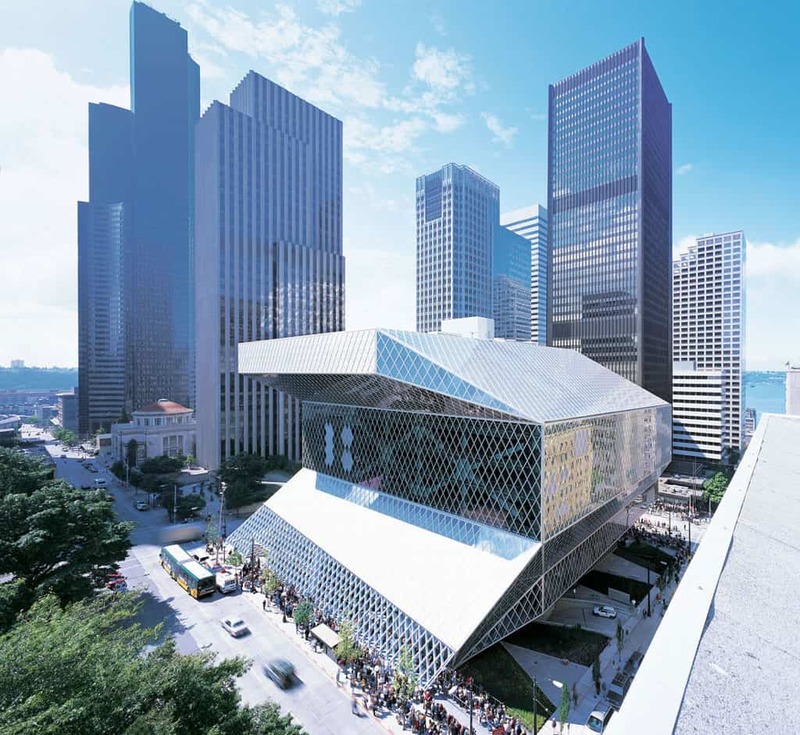 The design team covered the jagged boxes with a structural skin and voila – the new Seattle Central Library! This is what OMA has come to refer as a “hyper-rational process” – where the programmatic data from the brief is the driver of the design process and not the fuzzy sketch of a starchitect. OMA argues that the biggest threat to the contemporary library is high modernist flexibility; where architects create generic floor plates that are ‘flexible’ to carry our whatever function. For libraries, this means that the bookcases allowed ample reading area on the opening day but as the collections inevitably expanded they started to encroach on the public spaces. With Seattle Central Library, the architects introduced compartmentalized flexibility – where related functions were organised in compartments. Thus, as the library expanded the ballooning of certain compartments would not threaten the extinction of other programs. One incredible design manoeuvre that compartmentalised flexibility afforded for the Seattle Central Library was in its one of a kind book spiral. The organisation of books in traditional libraries is plagued with flatness. As collections swell unpredictably, materials are dissociated from their categories by being pushed onto other floors. Sometimes, the excess volumes are thrown into the basement, moved to off-site storage or worse, become squatters in a totally unrelated department. To combat this, OMA designed the book spiral – a parking garage for books – which is a continuous ramp that runs for four floors. By being able to maintain the integrity of the Dewey Decimal System in a continuous ribbon running from 000 to 999, the different categories are able to organically expand or contract along the continuum without forcing a rupture. So yes, the idea of a library may be fighting for its life in the digital and information age but there’s hope. If architects continue to infuse social functions into this typology as OMA successfully did with the Seattle Central Library – then libraries will survive their impending extinction. Having vast spaces for kids to play; living rooms for people to meet, interact and play chess; mixing chambers where librarians can guide readers into continuous ramps of book collections; and enormous reading rooms flooded with light; is definitely the way to go! And since this particular building has been able to revitalise downtown Seattle not only socially but economically, I’m certain that architects can borrow a leaf… or two when encountered with a similar design problem.